Turkey has accused the EU of "biased" and "bigoted" attitudes in an EU assessment of its progress towards membership of the 27-nation bloc. The Turkish criticism came in a 270-page report on its membership bid - the first such report by Ankara. 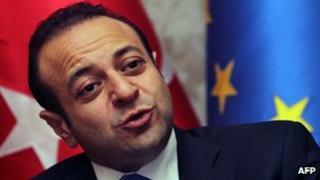 Turkish EU Minister Egemen Bagis said the EU assessment, published in October, was "one-sided and baseless". Turkey began EU accession negotiations in 2005, but the process has been extremely slow. So far only 13 of the 35 areas of negotiation - called "chapters" - have been opened. Just one chapter has been completed. Many influential politicians in France, Germany, Austria and some other EU countries are opposed to granting Turkey full membership. The EU Commission's October report acknowledges Turkey's reform efforts, but says more must be done to improve human rights, highlighting various violations in the Turkish justice system. "Allegations of excessive use of force continue to be a matter of concern, and there has been little progress on tackling impunity" in law enforcement bodies, it says. The Commission, which controls the EU accession process, also urged Turkey to make "a significant improvement regarding freedom of expression". It criticised the continuing detention of Kurdish rights activists, urging Turkey to revise its legal interpretation of "terrorism". The political stalemate over Cyprus has also delayed Turkish progress. The Republic of Cyprus is in the EU, but the breakaway northern zone, only recognised by Turkey, remains isolated from the EU. In his introduction to the Turkish response, Mr Bagis said the EU had failed to give due weight to Turkey's reforms. "Today there is no government in Europe which is more reformist than our government," he said. "While EU countries are struggling in crisis, our country is experiencing the most democratic, prosperous, modern and transparent period in its history," he said. "The 'sick man' of yesterday has got up and summoned the strength to prescribe medication for today's Europe."